Coaching collegiate distance runners requires different training strategies for cross country and track to achieve performance goals. Cross Country requires a pack running approach for the team to be successful; the entire team is competing at the same distance and in similar race situations. As a coach, my planning focuses on targeting a student-athlete’s running weakness and improving it for the team’s success. During track season, distance runners become more specialized, competing in events ranging from 800 meters to 10,000 meters and steeplechase. With specialization comes a training focus geared towards maximizing their running strengths. Track requires more personalized training than cross country, and to manage the different events, I organize my student-athletes accordingly using the categorization feature in TrainingPeaks. It allows me to broadcast training plans to groups of student-athletes based on whether they run middle distance (800m and 1500m), distance (5,000m and steeplechase), or the 10,000m. Those workouts will vary in volume and intensity depending on the ratio of aerobic and anaerobic demands required by the event. The increasing intensity of the workouts will dictate the scheduling of recovery days and the amount of recovery during interval workouts among the groups. Training plans designed for specific events must take into account the contribution of aerobic versus anaerobic energy systems needed to maximize performance at goal events. For each student-athlete these percentages will vary based on their physiology, race strategy and level of competition. Training plans should include the same ratio of interval training specific to their event over the course of the season. However, that ratio will vary depending on the training phase. For example, during early season training the percentage of aerobic effort will be higher for all events and anaerobic will increase during speed development. The key to successfully training student-athletes using energy system ratios is consistent application and a method to monitor the athlete’s performance during training. With my student-athletes I use heart rate monitors and a baseline maximum heart rate test. Heart rate is one method for monitoring intensity during workouts, it can be affected by multiple variables, but it is easily applied to large groups at a low cost. Without access to physiology lab testing, the Bruce Protocol Stress Test is a proven method to establish a maximum heart rate. The test is conducted on a treadmill and comprised of three minute stages which increase in speed and incline until failure. I determine training zones based on percentage to maximum heart rate for recovery, aerobic and anaerobic training efforts. TrainingPeaks allows me to customize my own overlapping heart rate zones for each athlete in their account settings to monitor their training intensity. The key zone for the purpose of specific distance event training is generally accepted to be 80% of max heart rate, or the point of transition from aerobic to anaerobic energy systems. With consistent application of this process when developing a training plan and monitoring performances, coaches can insure that your student-athletes perform at their best. Recovery is as crucial to success as intensity, both during interval training and in the scheduling of workouts during seasonal training periods. Anaerobic interval workouts should consist of full recovery between intervals regardless of the student-athlete’s event. In my training plans, this will range from 100% to 200% of the interval time run. I will adjust recovery by athlete or group while monitoring the workout; this is where the art of coaching occurs and the pitfalls of heart rate based training can be avoided. It’s important for the student-athlete to reach the desired stress level on each interval and recover to repeat the effort. Equipment and staff is normally not available to determine set paces for intervals through physiology testing. Because I am training athletes for competitive events, not fitness, I base the pace on previous race performances and goal times. As training progresses and I review the uploaded data in TrainingPeaks, new goal paces will be determined for the next workout. I record the student-athletes entire workout including intervals and recovery in one file. In the file viewing window I can divide the workout into sections and record the necessary data to evaluate the workout and prepare for the next session. Scheduling recovery days between weekly interval sessions during track season will also vary with event specificity, and training intensity. As training intensity increases and the volume of anaerobic workload increases, the amount of recovery between workouts must also increase. During early season preparation when aerobic workload is the focus, workouts may be scheduled with one day or less of recovery and up to three aerobic intensity workouts per week. As the season progresses and the volume of anaerobic focused interval sessions increase, two or three recovery days will be needed to insure quality training sessions and the accomplishment of training goals. Although I preferred cross country as an athlete, I find coaching track an exciting challenge, which requires balancing the demands of different distances and applying training principles to specific events. To further an athlete’s development, I run student-athletes in alternate events prior to focusing on their specialty for major competitions or goal events. A student-athlete who normally competes in the 5,000m may compete the 800m and 1500m double to test their speed, establish new goal paces, and push psychological barriers pertaining to their ability. Since energy system contribution can vary by athlete, these non-specialty competitions give coaches the opportunity to personalize further training sessions and adjust the training plan for optimal performance. I have found that although time trials and testing are useful, student-athletes are always able to push themselves harder during competition than in training or in the lab. 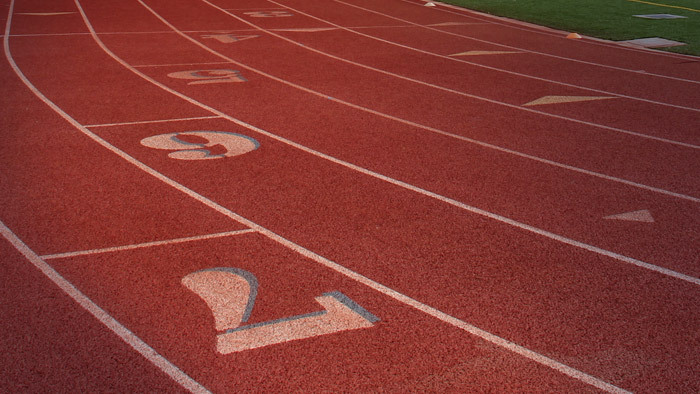 Following these guidelines will make your student-athletes perform their best during track, and provide structure to building and evaluating training plans, making you a more successful coach.